Cotton and dairy have dominated early discussions of the next U.S. farm bill, often involving pointed debate. Seven farmdoc daily articles have examined cotton (see May 18, 2017 article and articles cited therein). This article examines dairy. The underlying thesis is that the pronounced economies of size in producing milk are important to understanding the dairy policy debate. Economies of size: Using data as of May 24, 2017 from USDA (U.S. Department of Agriculture), Economic Research Service; total cost of producing milk is $26 per hundredweight ($26/cwt.) or 55% lower for herds of 1,000 or more cows than for herds of less than 50 cows and declines steadily across the various herd sizes (see Figure 1 and data note 1). 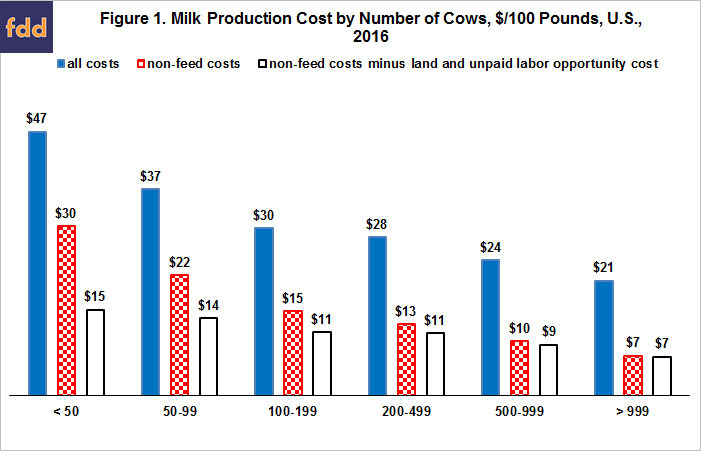 Non-feed costs explain 86% of the cost advantage of the largest vs. smallest dairy farms. Pronounced economies of size remain even if opportunity cost of unpaid labor and land is removed from non-feed cost. 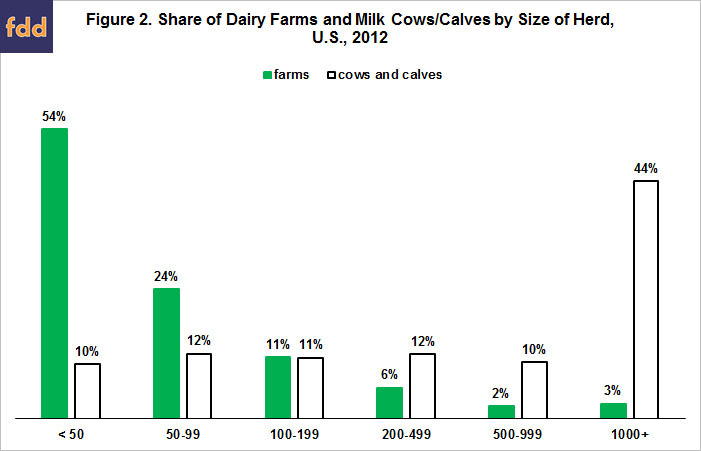 To put these economies of size in perspective, the 2012 Census of Agriculture reports that 44% of dairy cows are on farms with herds of 1,000+ while 54% of the 64,098 U.S. dairy farms have less than 50 cows (see Figure 2 and data note 2). Last, economies of size in producing milk are believed to be on the high side among ag commodities. 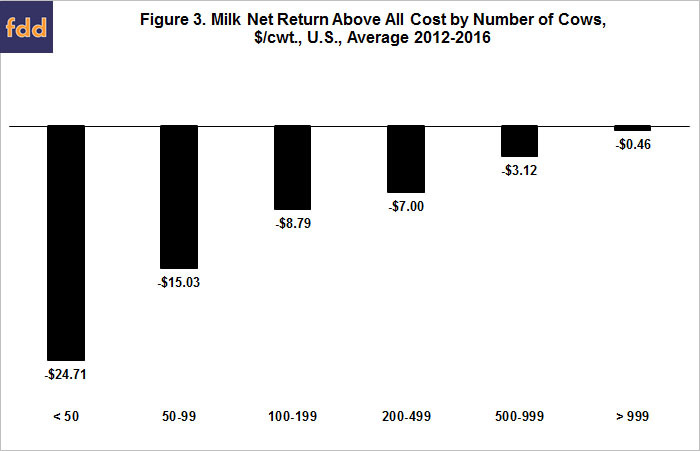 Net return: Average net return above all cost was negative for all dairy farm size categories over 2012-16 (see Figure 3 and data note 3). Due to the economies of size, loss declines notably as size increases. Moreover, a category of larger dairy farms may have covered all costs since cost economies continue to be observed even for the largest currently reported category. Economies of size in producing milk are so pronounced that, from the perspective of policy, the U.S. dairy sector is likely not a single sector. Put simply, smaller dairy farms confront a chronic low income problem; large dairy farms more likely confront an income risk problem. No support for either large dairy farms or the entire sector are policy options; but, debate is likely to remain pointed until policy addresses both the chronic low income of small dairy farms and the risk assistance needs of large dairy farms. Potential policy options for chronic low income of small dairy farms include fixed direct payments, return to a price counter-cyclical program, a new income counter-cyclical program that considers production/cow, or a small dairy oriented risk program / insurance contract. Potential policy options for risk assistance to large dairy farms include a risk program / insurance contract designed for their cost situation or providing vouchers that producers can use for one or more risk assistance options selected from a list. Different policy by farm size is a major change in underlying philosophy and approach of U.S. commodity policy. It is unclear if the U.S. is ready for such a switch, but it is also unclear if its dairy policy debate can be resolved without such a switch or at least debate of such a switch. Cost include both the cost of feed grown on the farm and purchased feed. Census of Agriculture milk cow herd is the sum of cows, heifers that calved, and other cattle. A 5-year average was calculated to obtain a longer-term perspective on net return above all costs. Gross value of production = (milk sold + cattle sold + other income). The 2014 farm bill replaced the Milk Income Loss Contract (MILC) and Dairy Product Price Support Programs with a Margin Protection Program (MPP) and Dairy Product Donation Program (DPDP). MILC in the 2008 farm bill paid all dairy farmers 45% of the difference between $16.94/cwt. and, when lower, the monthly farm price of fluid milk. MILC contained an income limit for eligibility. The 2008 farm bill price support program purchased cheese, nonfat dry milk, and butter if their price was below a statutory level (block cheese, $1.13/pound (lb. ); barrel cheese, $1.10/lb. ; butter, $1.05/lb. ; nonfat dry milk, $0.80/lb.). MPP in the 2014 farm bill provides assistance against a low milk price-feed cost margin. A basic margin of $4.00/cwt. on 90% of a farm’s production history is available to all dairy farms for a $100/year fee. Higher coverage can be bought in $0.50/cwt. increments, up to an $8.00/cwt. maximum for 25% to 90% of a farm’s milk production history. A premium is charged for higher coverage; it varies by margin coverage level and if the amount of milk production history covered is more or less than 4 million pounds. Once enrolled in MPP, producers must obtain coverage annually. Unlike MILC, MPP does not contain an income eligibility limit. DPDP is activated if the milk price-feed cost margin is $4 or less for 2 consecutive months. Dairy products are bought and donated to nonprofit organizations that provide nutrition assistance to low-income populations. (Sources: Congressional Research Service and Farm Service Agency fact sheets). Zulauf, C., G. Schnitkey, N. Paulson, and J. Coppess. "Generic Base's Impact on Planted U.S. Acres: A Multi-Commodity Perspective." farmdoc daily (7):92, Department of Agricultural and Consumer Economics, University of Illinois at Urbana-Champaign, May 18, 2017.